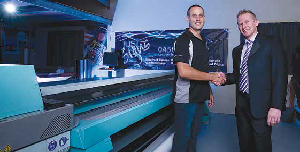 The Caboolture-based sign powerhouse Just Signs, which offers everything from vehicle wraps to 3D signage, finally decided to acquire a Fujifilm Acuity Advance HD flatbed UV press. After speaking with three other vendors, the duo approached Fujifilm and had the press operating only two weeks later. “I must say the whole process went completely smoothly”, Brad says. “We have been producing jobs without a hitch from the word go”. The low-use, pre-owned Fujifilm Acuity Advance HD installed by Just Signs came with the roll-fed option and a bed that enables production of panels up to 1,220mm x 2,440mm, with full bleed, at up to 22.2 square metres per hour. In roll mode, it can print up to 17.5 square metres per hour, on rolls from 900mm to 2,200mm wide. Fujifilm Uvijet KI ink series in CMYK plus white is being utilized and jetted via piezo-electric printheads with variable droplets from 6 to 42 picolitres in size. Just Signs hasn’t had a problem sharing the news of its success: “Word is getting around that we can produce excellent quality on a variety of rigid and flexible materials and turn around the jobs very quickly”, Brad shares. “We are very happy with the Acuity Advance, and Fujifilm will definitely figure in the next stage of our planned expansion”. If you want to learn more about the Acuity Advance and how it can factor into your business, don’t hesitate to contact us today.